Trees require regular pruning, trimming and maintenance. When a tree dies or becomes diseased, it must be cut down in order to avoid human injuries and damage to nearby structures. Tree cutting and pruning are best left to professional arborists as homeowners may experience one or more of these common tree cutting accidents if they attempt DIY tree cutting and maintenance. According to the Centers for Disease Control, the most common tree cutting accident is being struck by a falling object. In most cases, the falling object is a tree branch or limb. 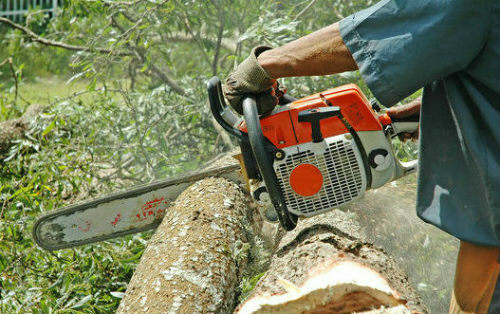 Falls are the second most common type of tree cutting accident. The person cutting the tree may fall off a ladder, fall off the roof if accessing the tree via the roof or fall out of the tree if accessing limbs by climbing the tree without proper harnessing. When a tree is planted near overhead power lines, there is a real risk of electrocution to anyone trimming the branches near the wires. The person may accidentally touch the wires himself or herself, or a falling branch could knock the wires down and the tree trimmer could step on or be touched by the falling wire. In the event of an equipment failure such as the malfunctioning of the lift mechanism of a bucket truck or the breaking of a climbing rope, the tree cutter could be thrown against the tree or pinned against another structure, resulting in an injury. Cuts are another common type of injury that a person may receive while cutting down a tree. In most events, the cuts are a result of improper use of power cutting equipment such as chainsaws or when using manual tools such as a hacksaw. Using power tools and heavy equipment such as chippers leads to the risk of amputation of fingers, a hand or even part of the arm. This may be a result of an equipment malfunction or operator error. Sawdust and chips of wood that become airborne while cutting the branches or trunk of a tree may get into a person’s eye and cause a corneal abrasion, scratch or cut to the eye. Eye injuries may also result from chips of wood or sawdust flying out of the chipper when the tree cutter is disposing of the branches or stump at the site of the tree cutting. Tree bark that comes into contact with bare skin may result in scrapes. In some cases, splinters of wood may enter the opened skin. Infections may develop if dirt gets into the open wound. Trees can be home to a wide variety of animals and insects. When these animals or insects are disturbed by actions such as cutting off branches or cutting down the entire tree, they may attack the tree cutter. Raccoons, squirrels and other small animals living in the tree may bite. Bees or wasps with hives in the tree may sting. These insects tend to sting in swarms. Ants living in a tree may also bite or sting. Poisonous plants including poison ivy, poison oak and poison sumac may grow up a tree. These plants can be difficult to detect as their leaves blend in with those of the tree. Exposure to any part of the poisonous plants may result in dermatitis, blistering, infection and serious allergic reaction.